This should really be the starting point to making any modifications to the bike. What good is more power if you can't get it to the road, or stay on it. One nice thing about this mods is that unlike engine ones a little goes a long way. First of all, think that the suspension tuning is near a science. Personal weigh, kind of driving and handling tastes are a major factor here. Like a guide, I weight around 72-75 kg kg, think 80 kg with all the equipment. Motorbike suspension is basically the springs. The hydraulic controls the springs, so the 1st thing you must do is adjusting the springs to the motorcycle and personal weight. Once again I repeat that for the correct suspension work it is necessary that the headstock and the relay arms bearings make their function correctly, being greased and operate smoothly. I´m tired of repeat that the head stock and relay arm bearings must be dismounted, re-greased and properly packed and refitted is a basic work in our bikes, each 2 years or 24.000 kms. It is extended when refitting wheel bearings: before of proceeding to fit any new bearing I open carefully the plastic cover of the bearing and always add a good quality bearing grease. Usually the bearing grease look a scarce resource at the bearing factory. The grease oxidise with the time and the molecules break because of the friction and pressures on. Along my life I've tested various quality greases in my vehicles. 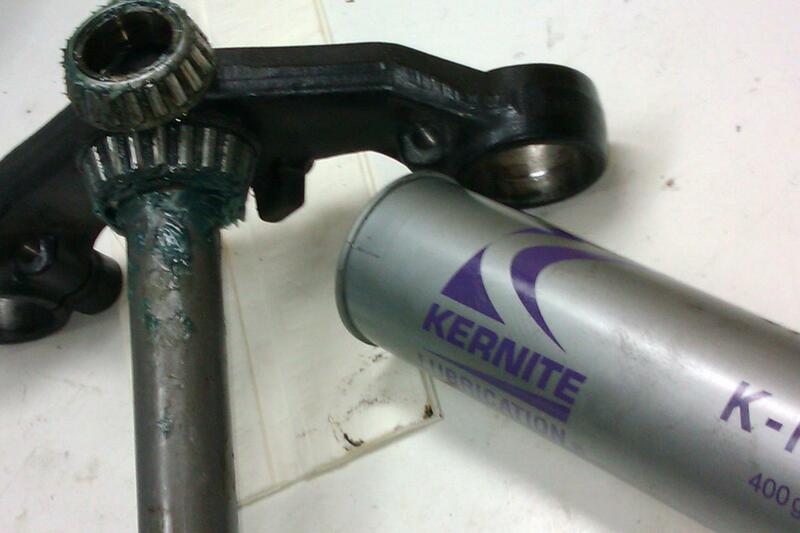 But never, NEVER when I've dismounted any part the grease looked like NEW, like this KERNITE grease. In this case with 3 years and 24.000kms. 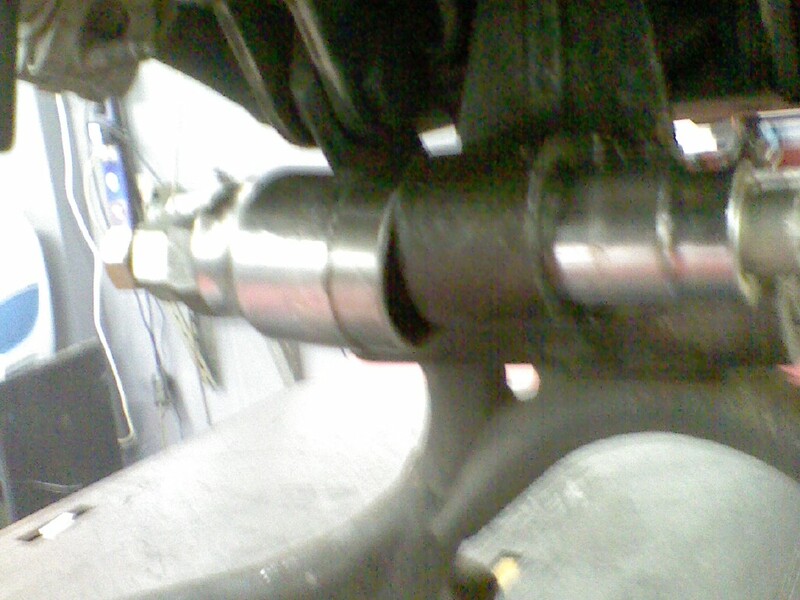 At the pic you can see my Honda yoke like it was dismounted, with the grease looked like it was just spreaded. Amazing! I have tested my FJs with 4 different springs: original equipment, Progressive Suspension, Hagon and öhlins. Öhlins springs are too hard: it is difficult even refit the top fork caps compressing the springs, and after fitted, the fork has not movement at all. So don’t fit them unless you are planning to eat a lot of hamburgers or you weight more than 200 kg. Between Progressive Suspension and Hagon I think Hagon are the best, because of more progressive and better feel. Progressive ones are a little harsh too. Hagon are awesome and the bike gives total confidence with 25 cc less oil than OE stated quantities in each leg. With the 10-40 w engine oil the fork is perfectly dampened, absorbing bumps but with a perfect little dive when hard breaking. This is true for the 1100 and 1TX and 3CV FJ 1200s, but not with 3XW, 1991 on 1200: the longer travel fork of this model don't work very well with the STD Hagon springs. I would order a softer rated springs. The original springs are not too bad, but the bike dives and bounce when hard riding. And with a few kms. they get soggy and tired. With new harder springs you can rise 1cm max. the forks above the fork clamp, so you gain in agility. This is more necessary in the + 1988 versions, with 17 inch front wheel. On the latest 3XW this is a necessary adjustment, changing the whole bike impressively. 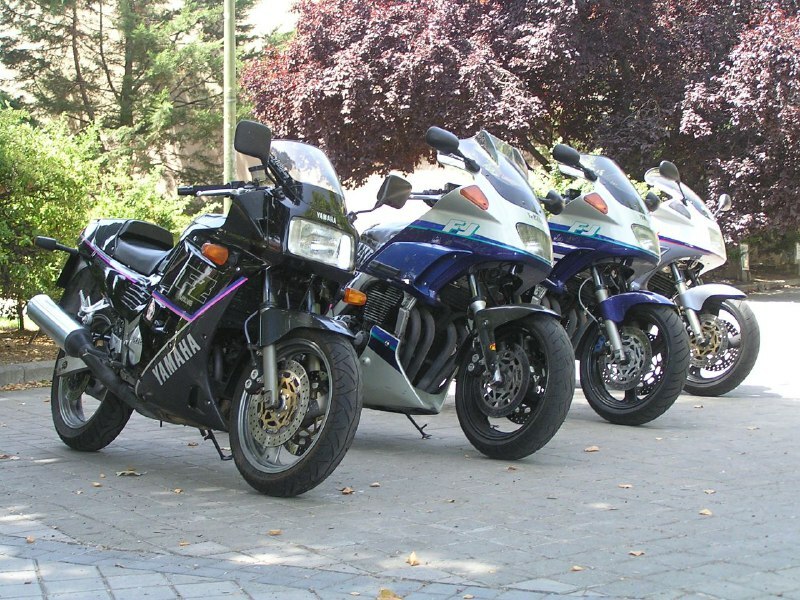 The workshop manual specifies Sae 10-30 w motor oil in the FJ 1100 forks. Use 10-40 w engine oil. Cheap than the fork oils, more resistant to degradation (so the fork inner components are more protected), more consistent damping... Excellent results!. In fact, the fork oils are cheapo oils with less additives than engine oils forced to work with more strain, more pressures and molecular degradation due to the mechanical pressures on the gear train. My bike suspension is spot on. Front & rear sags are perfect, the bike is controllable AND comfortable, I ride with fast riders on modern bikes on weekends without complexes and only a tweak on springs let me going into closed tracks. So It is not necessary any change. In fact the only motivation to make this mod is the aesthetic porpoise. I look the FZR 1000 320 mm. discs, and the mod look easy at first approach because both forks look similar. First surprise: you can not fit the FZR legs on the FJ yokes. 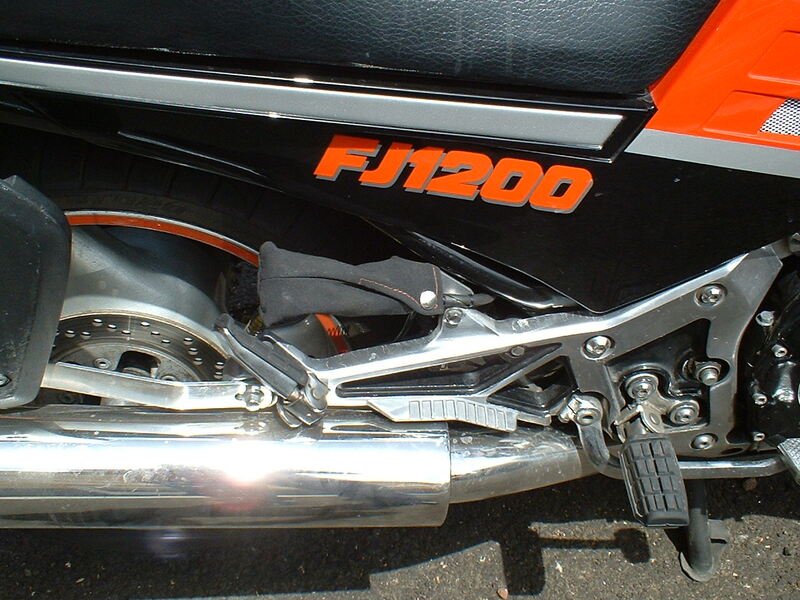 FJ triples have fork legs at 210mm cl to cl. FZR triples have fork legs at 200mm so if you are going to use the FZR '87-88 forks, you will need to use the yoke as well. Using the yoke is easy due to the head bearings are the same in both models and you don't have to find any problem simply fitting the complete FZR yokes into the FJ headstock. 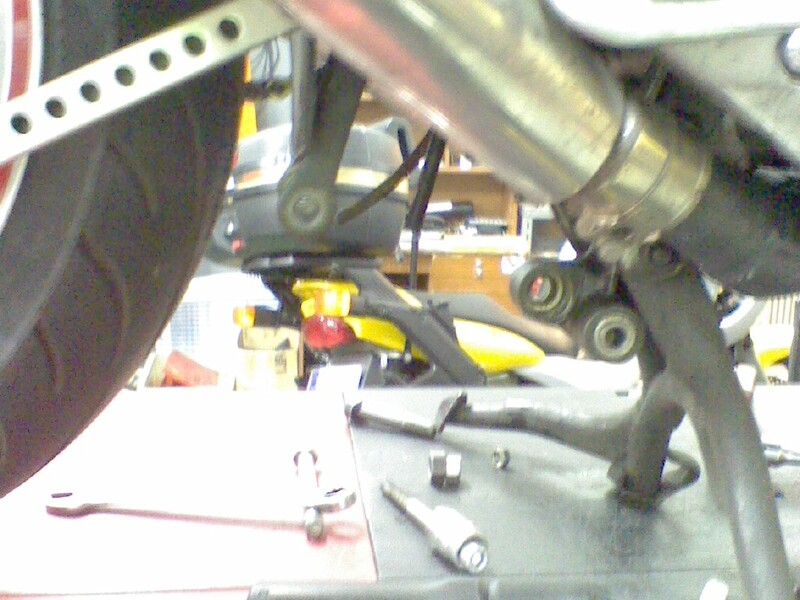 The following problem is that the FZR forks are 3,5 cms. shorter than the FJ forks as well. And it is too much. You would have to be fiddling with other handlebars or rear height to compensate. And I´ve found that inner FZR 41 mm are obsolete and near impossible to find. So a potential problem when searching for spares and clearly a BIG negative point in order to make the conversion. The only drawback is that FZR vases don't provide place to fit the screw that holds the FJ hydraulic unit in place when remounting the forks, so to find the hydraulic unit slot when refitting the fork caps can be a pain in the arse. - Adjust the remote control in the hardest position (5), disconnect it, take back the adjuster to the 1st position and connect again. Be careful that the damping adjuster is at position 3 when disconnecting and keep it there when changing the preload adjuster from 5 to 1. Öhlins: this is a pretty much the state of the art in shocks, but the actual difference in performance over the other listed here is questionable. The FJ fitment takes hydraulic preload, mounted in the original remote shock adjuster place. It is a fantastic shock, well dampened and good value for money. And at Hagon there are excellent professional who love their jobs. The only drawback is that the damping adjuster is via an Allen screw at the down body of the shock, but it is an easy task reaching the adjuster with the Allen key supplied. The only drawback is the reliability: it looks like the debris from the Tenerife road pavement scratch the shock rod and then start to leak oil (this is the official Hagon explanation). The shock was repaired 3 times in a year by the excellent warranty service. YSS shock: when ordering the shock is made adjusted to your weight and driving style. I bought it because an expert rebuilt suspension service from Madrid recommended it to me due to the high quality of the design and construction. So excellent are the original shock settings that my Honda CBX behaviour was immediately improved, being the shock spot-on. And the best of the shock is that it is height adjustable. 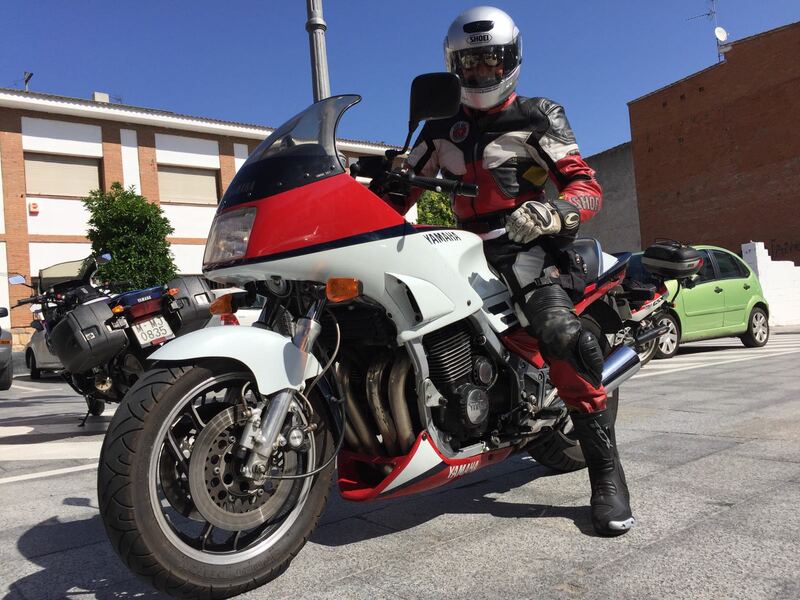 In July 2017 I tested the fantastic FJ 1100 restored by my friend Javier, from Valencia, with an YSS shock fitted. AWESOME! the bike feels fantastically suspended, and completely integrated, the handling is like a toy, going side to side only with only a thought, and letting using the fantastic rev-hungry engine until the redline. our bikes are experimenting a come back to their origins. Mingo, JC and myself mount OE new rear shocks with the spring trick done. Our bikes are spot on, the shock is very resistant and you can change your settings easy and fast. On post 88 FJ models you can shorten the rear rods legs, upping the rear of the bike and gaining in agility. This is a necessity if you fit modern rim sizes because the short total diameter of the wheel with modern tyres. Check the centre bearing fitted in the central rod assy: if it is in bad shape, change it. It is an expensive bearing: To extract it, make an extractor with 1 stud, nut and shim and 2 vases, 14 & 17 mm, as you can see at the photos. The last FJ development is the heaviest and slowest of the lot, but also fits the sweeter engine which has less vibrations and a superb aerodynamic protection. And completely OE is the best of all in its role as tourism as comes from the refinement of a sport bike along the years. My history with the 3XW comes from when my friend JC bought one in 2006. Since then we tried to improve it but we got not really emulate the behavior of my 3CV in agility, strength, manoeuvrability and stability, all toghether. Which it was a shame, because the completely std engine except for a couple of IXIL cans and a KN filter, was a marvel of smoothness, power and progressiveness, with better touch on the 3CV low down due to an optimized ignition curve at low rpm by Yamaha. Front fork: As I commented above in the text, Hagon or Wilbers springs are too hard for this bike and do not work well. As always, the simplest thing is what worked best: original springs, fork legs raised 1 cm. above the top yoke and engine 10-40w. oil with 150 mm. air gap is how we got the best results .. Anyway the fork behaviour was never like forks or 1TX 3CV with Hagon and with the same oil. The 3XW fork has a much longer travel that gives inconsistent feeling and were never satisfied: or the fork was very hard and jumping on potholes or very mushy and didn't give confidence, and never in accordance with the rear. Rear shock: JC bought a Hagon, but without remote control spring adjustment. The first lesson learned is NEVER BUY A REAR SHOCK WITHOUT A REMOTE SPRING ADJUSTMENT CONTROL UNIT. The double nut system is sunk in the depths of the motorcycle, impossible to reach with any key to change the settings easily, and you finish peeling your nurckles... and finally not changing settings only for the work involved or using a hammer and a screwdriver in desperation and destroying the castellated nut . Very uncomfortable. And sometimes just changing tire with different housing (eg Metzeler to a softer Dunlop) requires a small correction spring, that you will not perform due to the difficult involved, which will affect the behavior of the bike .With these difficulties to change settings in the end you're always riding with bad settings. And as always, back to the original spring and hydraulic damper in position 4 we achieved the best combination. 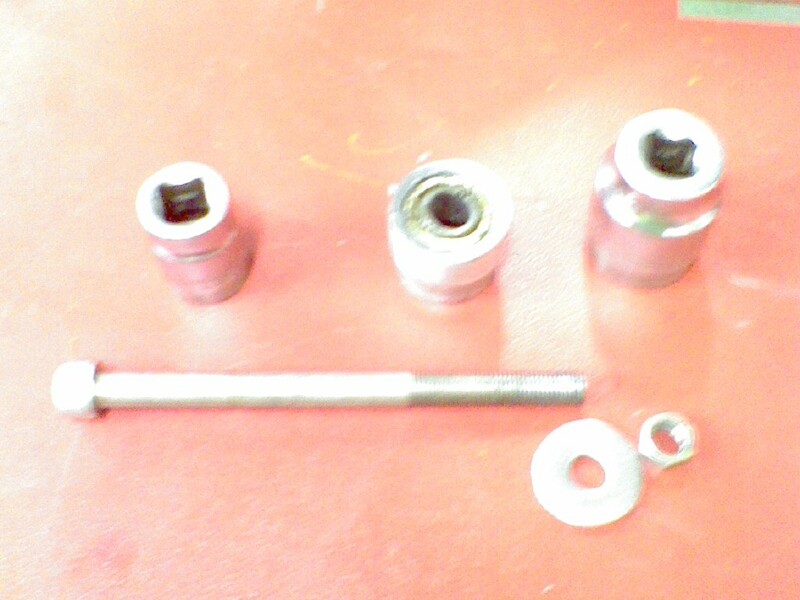 And with the OE Yamaha shock tool the adjustment is a doddle. key home is not as difficult to adjust. Conclusion: Although with the final adjustments set above (the cheapest and easiest way, as always) the 3XW was not as fabolous bike as a 3CV. So JC bought his actual 3CV bike, transplanted tires and brakes and I bought the 3XW that was left with the 3XW STD wheels, suspension and brakes. And that was the best 3XW that I met until then: perfect, soft, sweet, stable, relaxed ... a workhorse bike for every day and to travel to the end of the world on weekends ... Of course, with 80% of sporty capabilities than my 3CV. When you riding was serious, you really missed brakes power and felt the tall rear tire flexing. But you have to ride very hard and strong. Most people would be happy with a 3XW with only the subtle mods exposed. After all these years I have ridden different 3XWs with varying degrees of tuning or improvements. Finally, after much tinkering, we have achieved among all the perfect combination to design the best 3XW we've tested to date. First of all I have to say that "inventions" like inverted forks like GSXRs or YZF 600 right way forks are a step in the bad direction to improve handling: it is very difficult to find the right set-up not only with a correct geometries with new elements, but pretend that a fork designed with springs and hydraulic for another model entirely different in geometries and weight is a no sense. Hence, although very showy, these preparations go really bad, as I tested this summer with a 3XW YZF 600 fork fitted. (2nd for the left at the pic). Even although the owner had tested a lot of springs and oils, with different measurements from the top yoke, the bike didn't turn correctly and when you fight and you get it there, the bike wanted to throw to the ditch. Standard fork with 10-40w motor oil and 150 mm. airgap. Original springs. Fork legs raised 1 cm on top yoke. Original shock absorber. Shorter tie-rods. Dunlop Roadsmart Tyres.